Functional acetylcholine receptor (AChR) and sodium channels were expressed in the membrane ofXenopus laevis oocytes following injection with poly(A)+-mRNA extracted from denervated rat leg muscle. Wholecell currents, activated by acetylcholine or by depolarizing voltage steps had properties comparable to those observed in rat muscle. Oocytes injected with specific mRNA, transcribed from cDNA templates and coding for the AChR ofTorpedo electric organ, expressed functional AChR channels at a much higher density. Single-channel currents were recorded from the oocyte plasma membrane following removal of the follicle cell layer and the vitelline membrane from the oocyte. The follicle cell layer was removed enzymatically with collagenase. The vitelline membrane was removed either mechanically after briefly exposing the oocyte to a hypertonic solution, or by enzyme treatment with pronase. Stretch activated (s.a.) currents were observed in most recordings from cell-attached patches obtained with standard patch pipettes. 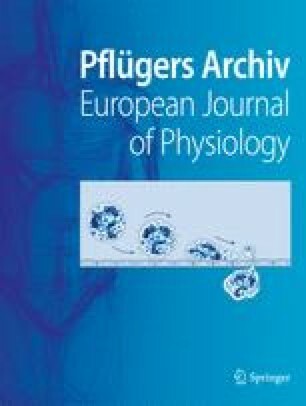 S.a.-currents were evoked by negative or positive pressure (≥5 mbar) applied to the inside of the pipette, and were observed in both normal and mRNA injected oocytes indicating that they are endogenous to the oocyte membrane. The s.a.-channels are cation selective and their conductance is 28 pS in normal frog Ringer's solution (20±1°C). Their gating is voltage dependent, and their open probability increases toward more positive membrane potentials. The density of s.a.-channels is estimated to be 0.5–2 channels per μm2 of oocyte plasma membrane. In cell-attached patches s.a.-currents are observed much less frequently when current measurement is restricted to smaller patches of 3–5 μm2 area using thick-walled pipettes with narrow tips. In outside-out patches s.a.-currents occur much less frequently than in cell-attached or inside-out patches. AChR-channel and sodium channel currents were observed only in a minority of patches from oocytes injected with poly(A)+-mRNA from rat muscle. AChR-channel currents were seen in all patches of oocytes injected with specific mRNA coding forTorpedo AChR. In normal frog Ringer's solution (20±2°C) the conductance of implanted rat muscle AChR-channels was 38 pS and that of sodium channels 20 pS. The conductance of implantedTorpedo AChR channels was 40 pS. The conductance of implanted channels was similar in cell-attached and in cell-free patches. The conductances of rat muscle AChR and sodium channels implanted into the oocyte membrane were similar to those of channels in their native muscle membrane, suggesting that important functional properties of these channels are determined by their primary amino acid sequence.